The following information is as supplied by BMWNA. The order of the pages is not clear and there seems to be some missing information that I'll try to fill in later. 1 electro-powered-motor, 2 channel pressure modulator with integral electronic control unit and ABS relays. This entire unit is favourably positioned, from the point of view of the centre of gravity, near the battery and thus does not adversely affect the handling of the motorcycle. Owing to its compact design, the ABS II is only half as heavy as the ABS I (i.e. 5.3 kg as compared with slightly less than 10 kg) and is characterised by its greatly enhanced control convenience. The rotating speed of the front and rear wheels are measured inductively. The sensor itself is composed of an iron core about which a coil is wrapped. Direct current flows through the coil, in the process creating a magnetic field. A sprocket securely mounted to the wheel is routed past the sensor which transforms the direct current into a sinusoidal current by virtue of the change in geometry (tooth gullet and tooth tip ). The frequency of this sinusoidal current is a direct measure of the rotating speed of the wheel and is processed as such by the control unit. The pressure modulator ensures adherence to the preset brake pressure and is designed as a hydraulic/mechanical actuator. The brake pressure required is modulated by way of specific variation in volume. The pressure modulator operates within preset limits independently of the pressure and temperature in the brake system. The pistons in the pressure modulator are powered by an electric motor which causes a crosswise shaft to turn. An electronically controlled friction clutch is mounted on this shaft for each of the pistons (front and rear wheel). The other end of the clutch forms a direct connection with the steel strutted piston via a tie element. The amount of current applied to the friction clutch is a direct measure of the power with which the steel strutted pistons are caused to change in volume. A separate displacement sensor records the distance travelled by the piston and makes available this value to the control unit as a control variable. Advantage: faster and, as a consequence, decoupled control characteristics. All commands for activating the pressure modulator come from the control unit. The control unit of the ABS I I consists of three microcomputers. Two of them function as working processors, the third one as a watchdog processor. The two working processors are identical in design, perform the same computing operations and constantly compare the results obtained with one another. The system switches off if there is a discrepancy in the data computed by the two working processors during operation of the motorcycle. This is indicated to the motorcycle rider by the ABS Check Control light blinking. In this case as well, the braking system is fully operational, however without the ABS. If a discrepancy occurs in the data generated by the two working processors during a control sequence, the braking action initiated is carried out in any event by the working processor still intact function. Which of the two working processors is still functioning properly in this case is decided by the control or watchdog processor. This is followed by the system switching off. The watchdog processor is not identical in design to the working processors, however it performs the same computing operations. Consequently, the watchdog processor is capable of deciding which of the two working processors has provided the correct data and affords the respective working processor the possibility of completing the control sequence. The closed-loop control circuit consists of signal processing by the sensors and automatic control electronics which activate the electro-motor-powered pressure modulator in the event of overbraking by the wheel. If the ABS control unit detects that wheel locking is about to take place on the basis of impulses being received from the rotating-speed sensors, it activates the motor of the clutch shaft. At the same time, the electro-magnetically controlled friction clutch of the respective brake circuit mounted to the clutch shaft is activated. Depending on the frictional torque generated by the control unit in this clutch, the plunger piston in the pressure modulator is pulled downwards against a spring resistance by a precisely defined amount. The resulting enlarged volume above the plunger piston results in the pressure decrease required in the brake circuit. At the same time, the movement of the reciprocating piston is recorded by the displacement sensor and forwarded to the ABS control unit, which obtains the information needed concerning the position of the piston in this manner and thus has a reference as to the relative brake pressure in the brake circuit. This scanning takes place within the closed-loop range every 8 ms and in the open-loop range every 4 ms. The wheel is optimally decelerated just below the locking limit. This control sequence is repeated every time the wheel is on the verge of locking. 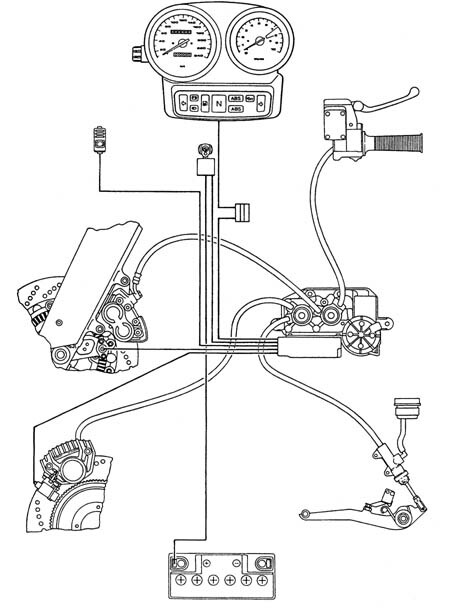 This system is the first system to enable recognition of the relative pressure by virtue of the displacement sensor of the reciprocating piston, with its corresponding position consequently making it possible to operate the motorcycle in accordance with any brake pressure curve in keeping with the respective riding conditions. Based on the rotating-speed information coming from both wheels, this system is also capable of detecting lifting of the rear brake when the brakes are fully applied and preventing th is by correspondingly regulating the pressure in the front wheel brake circuit. Owing to the fact that this system employs a plunger piston, the brake pressure can be decreased to 0 bar, thus ensuring dependable control behaviour on difficult riding surfaces, e.g. black ice, gravel etc. 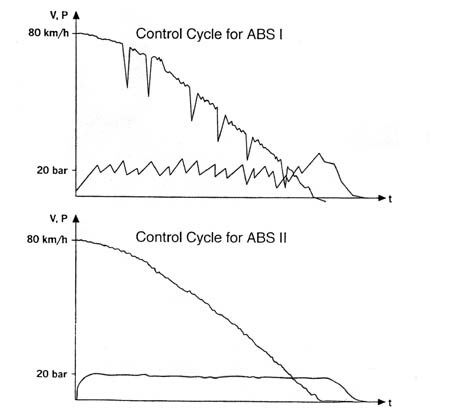 The following standard tests have been integrated in the ABS II in order to fulfill BMW's high safety and security standard ("Every conceivable system fault whether electrical, electronic, hydraulic or mechanical - must enable the rider to sufficiently decelarate, even when the ABS is deactivated"). The ABS II is characterised by its compact design coupled with high electromagnetic compatibility (E¯C), making it ideal for motorcycles. It has only half the weight of ABS I and is optimally sited (i.e. motorcycle handling is not adversely affected). By virtue of the triple-microprocessor system, a level of safety and security is attained which is unparalleled in ABS systems to date. The ABS I I features outstanding control convenience, offering the rifder a valuable, easy-to-use tool whenever needed. The perfected software enables even extreme braking conditions, e.g. rearing of the rear wheel, to be compensated. In addition, safety while riding on difficult surfaces, e.g. alternately wet, dry or slippery surfaces, is enhanced. The displacement measurement of the reciprocating piston enables the rotating speed of the wheel to be maintained just below the locking limit. This ensures complete, virtually optimal utilisation of tyre-road traction. All of the above features of the ABS demonstrate once again that BMW is the innovative pioneer when it comes to state-of-the-art motorcycle safety and reliability. Through ongoing product development, BMW will maintain its leading edge in the future.